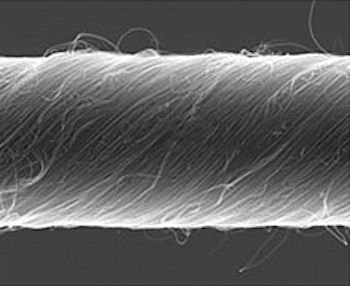 These "artificial muscles" made of carbon nanotube yarn can produce as much torque as an electric motor. This advance could lead to a variety of new applications. The twisty nanotube yarn could open up novel uses. It might help miniaturize electric motors, compressors, and turbines. Tiny pumps based on the rotating actuator could be integrated into lab-on-a-chip devices, which currently use large external pumps. "This is a fascinating new way to provide torsion," says Ray Baughman, director of the Nanotech Institute at the University of Texas at Dallas. Baughman led the work. In a paper published on the website of the journal Science today, the researchers show that the new yarn can spin a paddle 1,800 times heavier than itself at 590 revolutions per minute. They demonstrated how a simple device based on this concept could be used to mix two liquids on a microfluidics chip; in a fluid mixer, a 15-micrometer-wide yarn rotated a paddle that was 200 times wider and 80 times heavier than itself at up to one rotation per second. The artificial muscles.. which in this case are silastic and vitallium pulleys, then contract, twist, and tighten. Your arm should have on the order of ten times the gripping and handling strength you once had.